Michael and Dafna experience gut-wrenching grief when army officials show up at their home to announce the death of their son Jonathan. Michael becomes increasingly frustrated by overzealous mourning relatives and well-meaning army bureaucrats. While his sedated wife rests, Michael spirals into a whirlwind of anger only to experience one of life's unfathomable twists – a twist that can only be rivaled by the surreal military experiences of his son. 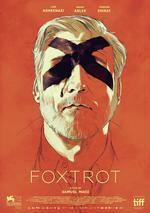 "An intricate, dazzling cinematic dance, FOXTROT goes both deeper in and further out than standard-issue cinema. It's profound and moving and wild and crazy at the same time, simultaneously telling a specific story and offering an emotional snapshot of a country whose very soul seems to be at risk." "Though it is all about mourning and loss, Maoz’ script reaches way beyond, unveiling in each one of his leading characters deep layers of past guilt that might have never been revealed in normal circumstances." "It is a formally gorgeous piece of work, the kind of film that exudes confidence in structure and tone, and it contains some of the most striking, memorable imagery of the year. Don’t miss this one."